Now more than ever, kids want to know about our country's great struggles during World War II. This book is packed with information that kids will find fascinating, from Hitler's rise to power in 1933 to the surrender of the Japanese in 1945. Much more than an ordinary history book, it is filled with excerpts from actual wartime letters written to and by American and German troops, personal anecdotes from people who lived through the war in the United States, Germany, Britain, Russia, Hungary, and Japan, and gripping stories from Holocaust survivors-all add a humanizing global perspective to the war. This collection of 21 activities shows kids how it felt to live through this monumental period in history. They will play a rationing game or try the butter extender recipe to understand the everyday sacrifices made by wartime families. They will try their hands at military strategy in coastal defense, break a code, and play a latitude and longitude tracking game. Whether growing a victory garden or staging an adventure radio program, kids will appreciate the hardships and joys experienced on the home front. About Senator John McCain (Foreword) : Senator John McCain is credited in children's books. 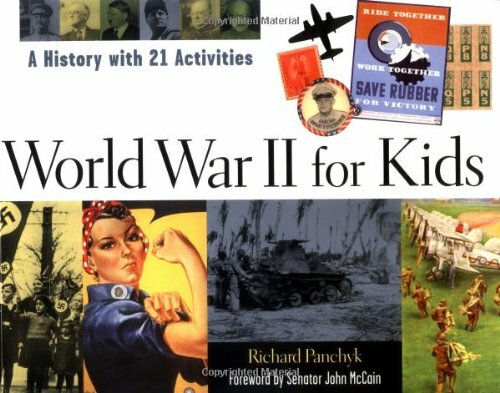 A published credit of Senator John McCain is World War II for Kids: A History with 21 Activities.